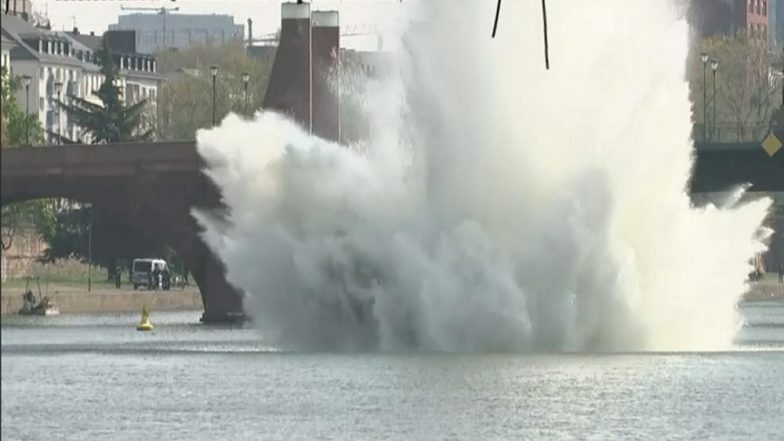 Toronto, April 15: After German divers discovered a World War II-era bomb in Frankfurt’s River Main, the bomb has safely been detonated on the river bed. The city evacuated six hundred people from close to the detonation site before a bomb disposal squad began preparations on April 14 to safely detonate the 250-kg bomb. The bomb was detonated shortly afterwards, causing river water to spurt meters high into the sky. The massive World War II bomb was discovered over the weekend by divers with Frankfurt’s fire service while participating in a routine training exercise. The city officials then sent out a warning notification of the immediate need to defuse the bomb. The event in fact drew onlookers as people lined the river banks, a few hundred meters from the explosion site. "I want to thank all the volunteers for their professionalism and their engagement -- And all the residents who had to leave their apartments for their cooperation and patience," Frankfurt Mayor Peter Feldmann tweeted. "My thanks also to all the facilities in the city that gave the evacuees free admission to the open museums, the palm garden and the zoo," Feldmann said at a news conference. Diesmal im Bereich #AlteBrücke im Main. In recent years, multiple German cities have seen WWII bomb’s unearthed at construction sites and such. In 2018, German police defused a WWII bomb in central Berlin, which needed for some 10,000 people to be evacuated. In 2017, close to 60,000 people had to be evacuated as authorities defused a much larger 1.4-tonne HC 4000 air mine, a British bomb, that was found at a Frankfurt construction site.